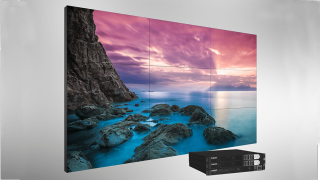 The What: Planar and Leyard have added two models to the Clarity Matrix LCD Video Wall System, featuring a tiled bezel width of 1.7 millimeters for nearly seamless LCD video wall installations. Planar and Leyard also introduced the Clarity Matrix ColorBalance, a color matching tool co-developed with Portrait Displays. Designed specifically for Clarity Matrix LCD video walls, Clarity Matrix ColorBalance helps achieve consistent color and brightness across the entire video wall. The What Else: Together, these releases extend Planar and Leyard’s Clarity Matrix family for a comprehensive LCD video wall lineup. Available in 46-inch and 55-inch sizes, the new Clarity Matrix MX46HDX and Clarity Matrix LX55HDX models offer a tiled bezel width of 1.7 mm, half the size of previous-generation models. The 500-nit brightness Clarity Matrix LX55HDX offers high performance and 24/7 reliability at a lower price point than Clarity Matrix MX models. It is well suited for indoor environments with controlled ambient light, such as surveillance and security command centers. Both Clarity Matrix models are integrated with the Planar EasyAxis Mounting System, which is optimized for extremely narrow bezel widths and offers optimal panel-to-panel alignment. The displays also have an installed depth of less than 3.6 inches, making them compliant with the Americans with Disabilities Act (ADA) for protruding objects. Planar ERO (Extended Ruggedness and Optics) technology is available as an option, providing an optically-bonded glass front that increases the ruggedness and optical performance of these displays in high-traffic and interactive touch environments. To address this issue of matching color and brightness of the displays in video walls, Planar and Leyard partnered with Portrait Displays to deliver Clarity Matrix ColorBalance, which offers users a more accurate way to match individual LCD displays that make up a Clarity Matrix video wall. With Clarity Matrix ColorBalance, installers obtain an automated way to calibrate color and brightness, saving time and reducing the complexity of performing manual calibrations. The tool also includes validation and reporting capabilities for installers to leave with clients. The Bottom Line: The Clarity Matrix MX46HDX is an ideal solution for customers who want the narrowest bezel available but need a smaller 46-inch display due to space constraints. The Clarity Matrix MX46HDX offers the highest in pixel density of all Clarity Matrix models and is optimal for applications with a close viewing distance or touch interactivity. The new models will begin shipping in calendar Q1 2017 through Planar and Leyard’s worldwide network of authorized resellers.